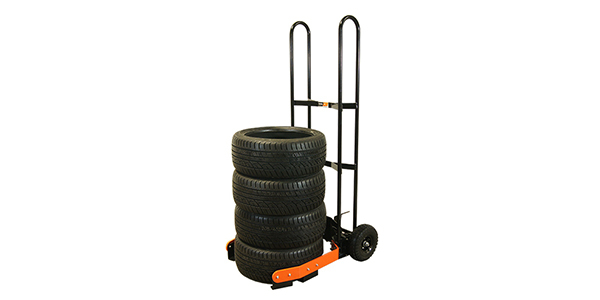 The Martin’s Industries tire cart, the Tire Rider Tuff, reduces handling, reduces the number of trips and helps avoid work stoppages and workplace accidents, particularly back injuries. 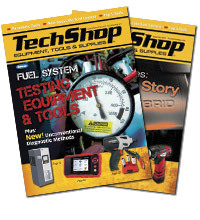 Your employees will greatly appreciate this tool, especially when working with larger, heavier tires. The tire cart carries passenger and light truck tires from 12 in. to 35 in. in diameter and can move six to eight tires at a time. The cart’s total width is 28 in. when closed. The tire cart uses strong and durable 50-psi wheels, which suffer less compression under heavy tire loads. The cart is painted with a black and orange powder-coated finish. A foot pedal opens the cart’s arms. The tire cart then slides under the stack of tires and tips back in the same way as a mover’s hand truck. A gas cylinder closes the cart’s arms around the tire stack. The tires sit securely in the cart for safe and easy moving.